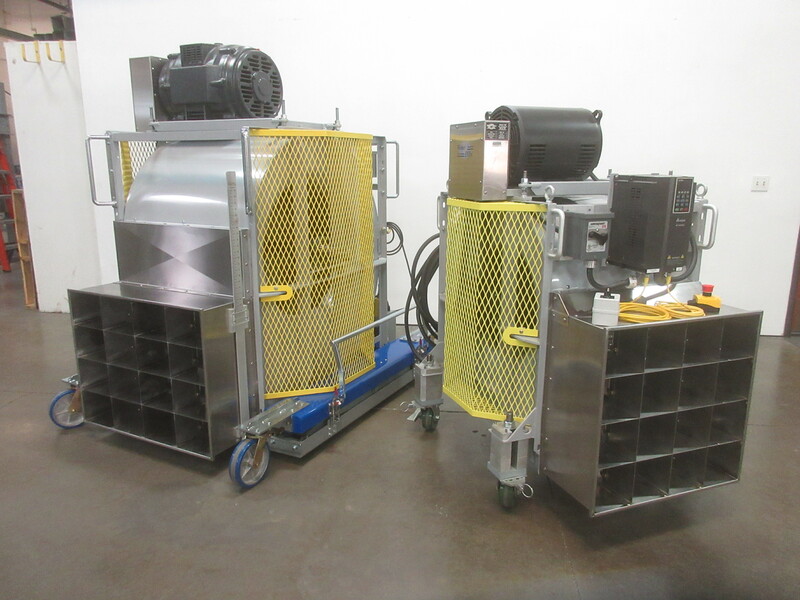 Webber EMI manufactures Proportional Speed Fans for use in specialty vehicle testing applications and based upon specific customer requirements. The Model 112 Series Proportional Speed Fans are designed to interface with your chassis dynamometer to replicate airflow across both a dynamic range or at a given road speed. Using this system, accurate assessment of engine performance and emission characterization is possible in a testing laboratory. From motorcycle and ATV applications up to Medium Duty vehicles, our fans will give you years of reliable and accurate service. The Webber EMI Model 112-40 LD/MD Proportional Speed Fan is designed to meet and exceed the EPA’s CFR part 86 and 1066. 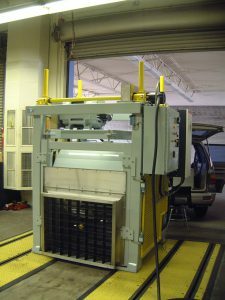 The Webber EMI model 112-40 has a footprint of 60″ W x 75″ D x 76″ H, which is among the most efficient footprints in the industry. Weighing just over 2600 lbs (1181Kg) it is heavy enough to achieve stability under its own weight, but can be easily moved around to different test cells on its casters. Our standard model runs up to 80 MPH, puts out 38,000 CFM and will meet virtually all of your LD & MD requirements for Proportional Road Speed Fan needs.. Using a user-provided 4-20mA or 0-10Vdc signal, this system delivers uniform air speed proportional to dynamometer roll speed via the mounted Variable Frequency Control Drive. 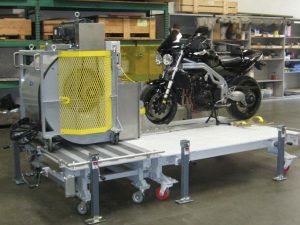 The fan height is achieved with an integrated hydraulic powered scissor lift, and has a mounted reference scale to allow for identifying and recording the discharge height. 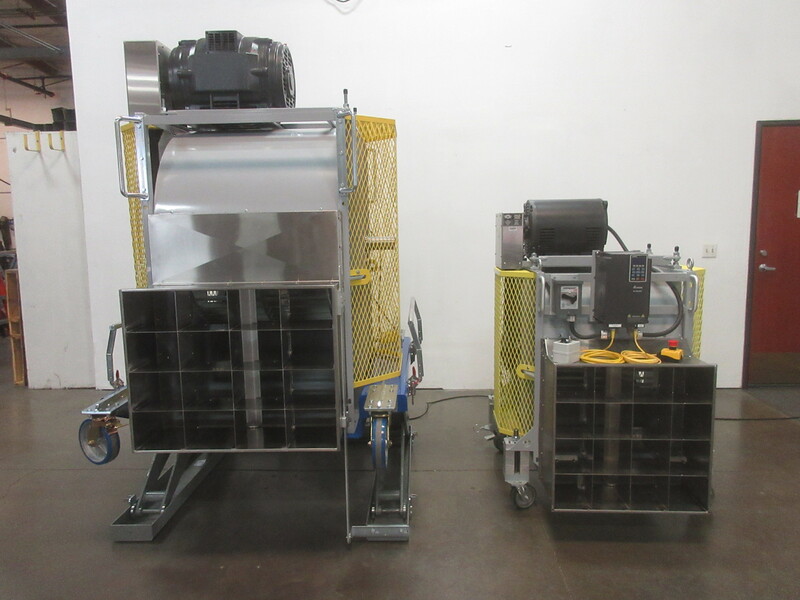 The Webber EMI Model 112 fan system incorporates a full array of discharge sizes from 4.34 sq ft to 5.5 sq ft and larger. Typical motor sizes are 15 HP, 25 HP, 40 HP and up to 75 HP. The stainless steel discharge nozzle is designed to accurately shape the air to yield a linear and uniform flow consistency that meets and exceeds regulation requirements. The standard configuration includes heavy-duty poly-clad locking wheels, personnel handles for easy movement and anchoring eye bolts for securing the system during high speed operation. Contact us for your Proportional Speed Fan needs. If our standard models don’t fit your requirement, our engineers will tailor a solution to your custom specification. 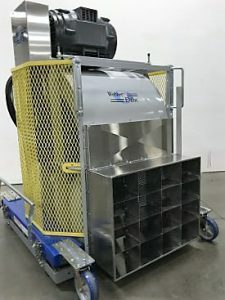 Our Webber EMI staff will work with you on your custom applications if your testing needs don’t fall within our 112 Series of Portable Proportional Road Speed Fans. Our team will take your application and develop potential solutions for you to review to get you the best performing fan at competitive prices.